This series of articles was originally written for UKC, offering information and insight into different aspects of training. In this first blogpost, Tom talks about endurance; the different types of endurance training, what sessions to do for each, and how to structure your training to your specific style of climbing. Find the original UKC article here. There is so much training knowledge out there these days that often it’s hard to get to the bottom of what you should do and why you should do it. This is before you even try and get your head around levels of intensity and how often you should follow these various training methods. In the years that I’ve been working as a coach, I’ve seen trends come and go and methods come in and out of fashion. In the end though, it’s some of the most basic, foundational aspects of training that will get you 90% of the way. Most climbers would do themselves a huge favour by tuning out some of the “noise” that they see on social media and on the Internet generally to focus on the fundamentals with quality, in the appropriate quantity and with the correct rationale. The reason for categorising in this way is to take you through aspects one at a time and use the backdrop of a new and free training app that we’ve been working on at Lattice, called Crimpd. 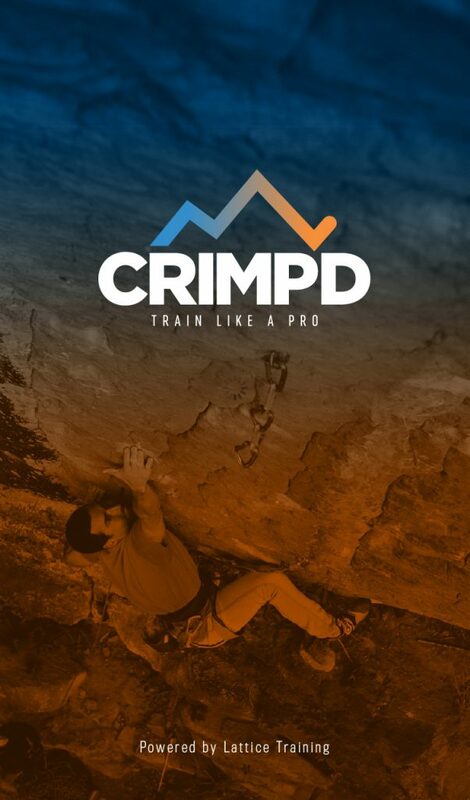 Anyone can download it to use on iOS or Android, and we’re really keen to give everyone out there a taste of what training feels like in a simple format and with no cost. I hope this sounds appealing and straightforward! In the simplest sense, the endurance that you have as a climber is your ability to climb constantly at a low-to-moderate level for durations over 1 minute. This will be climbing that features moves that are a long way away from your maximum bouldering level and is highly correlated with your route climbing ability — thus, the best route climbers have a good level of endurance. In addition, it’s highly related to your ability to recover on holds and in rests. It also has an effect on how quickly you get pumped on a route. It’s useful to further break down endurance into two categories: aerobic capacity and regeneration. Regeneration is more akin to recovery activity that’s perfect for rest days or at the end of long sessions. If you’re able to train your muscles to improve their aerobic energy production, then you’ll see obvious results in your grade! You can go for longer, you can climb at harder grades without getting pumped, and it also improves your power endurance further down the line. Secondary to this, the regeneration training will improve your recovery rates and also increase the amount of climbing training that you can handle over the years. We really can’t understate how important regeneration training is for both boulderers and route climbers. Let’s take an example workout from the app, which is 1 on 1 off. This session is one that sets the climber the task of climbing intervals that are just one minute long, and at an intensity that is around two grades under your onsight. The grade must be below your onsight. This gives you a high chance that the intensity is low enough to be an aerobic stimulus and that you won’t train anaerobically. Pump level is only high at the end of the session. For this session, it’s recommended that you choose terrain that is varied – don’t always do it on the same size of hold, either. 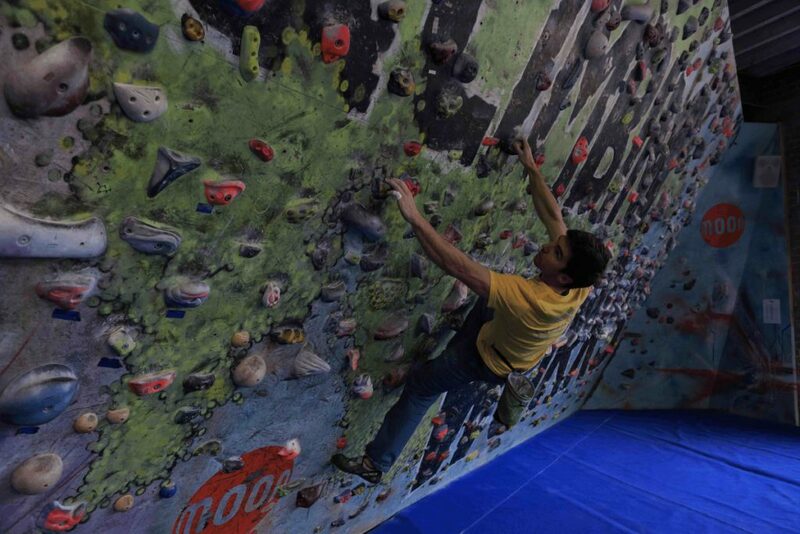 It works extremely well on bouldering walls, top-ropes and in lead climbing! The focus of regeneration workouts is to assist in physical recovery from more intense training and also improve localised blood flow. If you get the intensity correct then it can be done on rest days or at the end of hard, exhaustive training sessions. 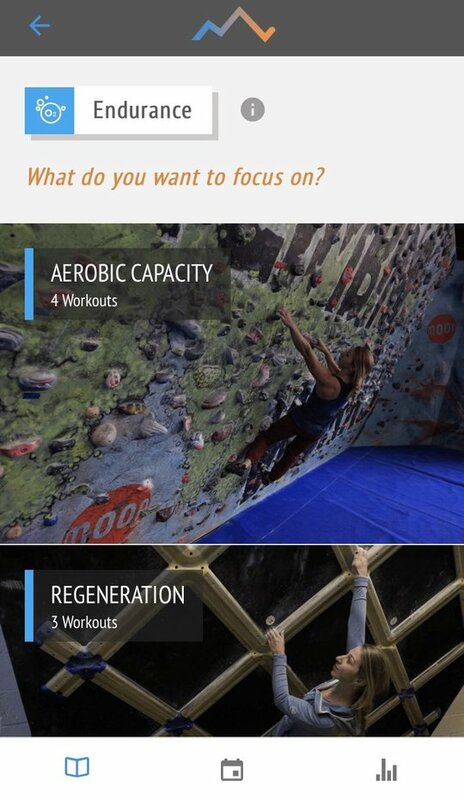 An example of this would be a session found in the app called “Continuity 5×3” which can be performed on a bouldering wall, roped wall or even a very easy foot-on campus board. 3 sets of 1 reps. The grade must be a long way below your onsight. 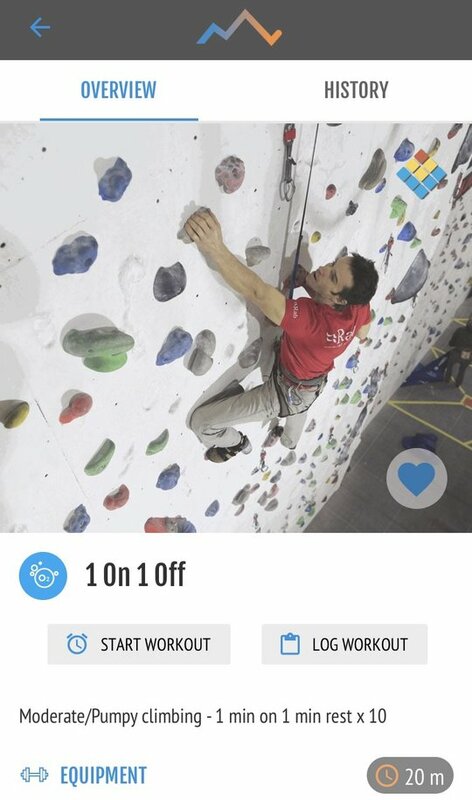 As a guide, you should play it safer than you think and the session must feel extremely easy – so easy that you could switch off from the climbing and chat to someone whilst doing it! Pump level is extremely low or non-existent. If you feel zero level of discomfort that is absolutely perfect. The key knowledge here is that this type of training is extremely beneficial to both boulderers and route climbers! The fact that you’re stimulating the forearm muscles to work aerobically is a great thing and the physical, technical and psychological benefits are long-term beneficial to all climbers. As a very rough guide, we would expect boulderers to do only 25-50% of the endurance training of a route climber and typically at lower grades. It’s really important to get this aspect right as both specialisations have different physiological demands. A route climber training three times a week should include at least 2 sessions a week that work an element of endurance and a boulderer would do at least 1 session. Endurance training is a localised aerobic form of training that is low intensity. Training and performance are not the same. You can train in relatively short blocks (for example 1 minute) and if done correctly, this will allow you to “perform” on blocks of significantly longer than 1 minute. 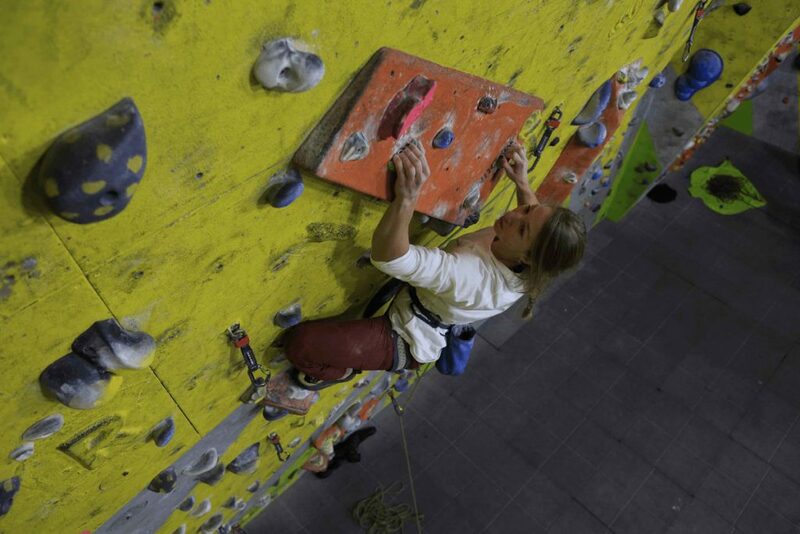 Your training should take into account your specialisation, whether it is bouldering or route climbing. Importantly, boulderers should do less of it and at a slightly lower intensity. Hi Tom, good article! I’m using the Crimpd app and I’m loving it! 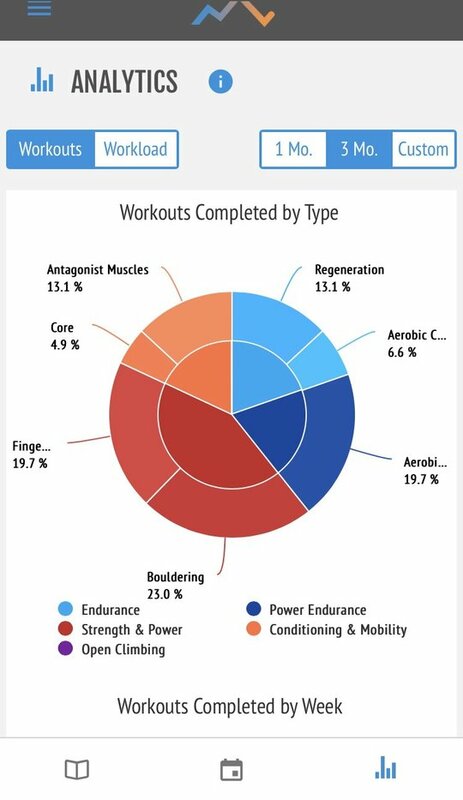 I would really like to do a training cycle with lots of these endurance sessions and test my aerobic capacity before and after the training cycle, but there doesn’t seem to be a good test I can do on my own for this energy system. In the app, there is the Max Moves (foot on campus) Test and the Max Moves (Lattice Board) Test but these tests are for power endurance, right? Is there a test for aerobic endurance I can do to test my progression? To complete a fatigue curve, campus until failure for one set. You are trying to achieve a maximal time. Record the time and use the same time as rest. Now complete 4 to 5 more sets using a 1:1 work rest ratio. The time will go down for each set and so will the rest. Testing this at the start of a training cycle and at the end will help determine how aerobically fit you are and you ability to recover between efforts. This will soon be available on the Crimpd App!